In a week that witnessed political compromise on a number of key fiscal tugs-of-war, the Keefe, Bruyette & Woods U.S. Bank Index (BKX) finally broke above key trend resistance. The extension of the Bush tax cuts for businesses and individuals, a generous agreement on inheritance taxes, a host of alternative energy credits, an unexpected 1-year cut in social security payroll taxes and a 13-month extension of unemployment insurance benefits resolved a number of “unknowns” that had, in the past, clouded investor’s vision. Although the Obama tax compromise needs to be ratified by Congress, many political observers expect the package to become ratified largely intact by year-end. From a technical point-of-view, last week’s bullish trend line break on the BKX is very important for overall market conditions. Most analysts believe for a legitimate turn-around in both the stock market and in the economy to occur, a healthy banking system is a must. Helping the now bullish outlook on banks and bank stocks was a steepening of the yield curve last week. This change in the yield curve structure, although more costly for long-term borrowers, helps banks capitalize on wider loan margins. In any event, the stage is now set for the S&P 500 index to take aim at key resistance near the 1,280 area with a possible “breakout” to the upside at stake. 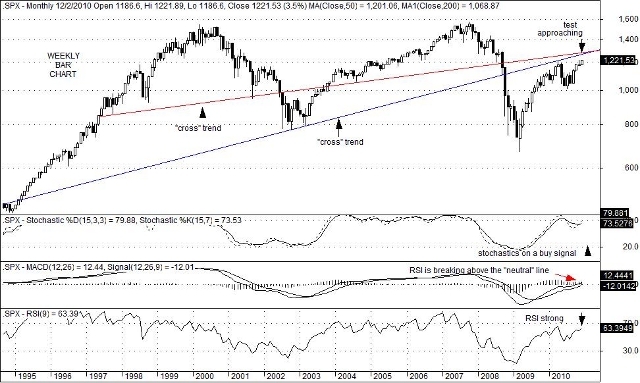 As 2010 approaches its conclusion, the S&P 500 Index (SPX) appears to be aimed for a test of the 1,280 level where two forms of “cross” trend line resistance coincide on long-term monthly bar charts. 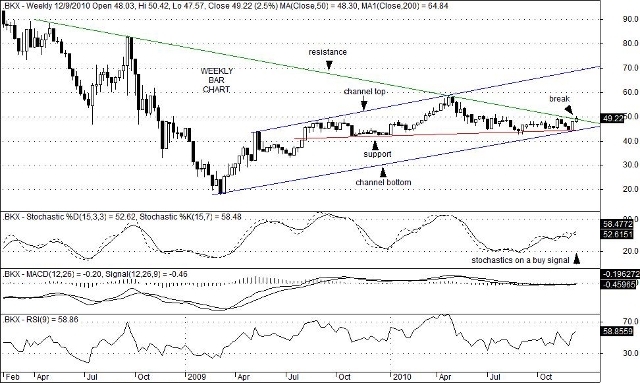 What is important from a technical point of view about this potential resistance test is that, although stochastic and RSI indicators are each strong, they are not yet in overbought conditions. Further, monthly MACD studies (Moving Average Convergence/Divergence) are now in the process of crossing above the “neutral line”. Historically, such a crossing is seen as being consistence with the “bulls” (or buyers) taking “control” of price direction from the “bears” (or sellers). As a result, even if monthly stochastic and RSI indicators were in an overbought condition by the time the 1,280 level was tested; the change in “control” suggested by MACD could lift the S&P 500 Index above this important resistance area. Adding to this bullish view is the observation that the Dow Jones Transportation Index (DJI) already broke above its key resistance level last week, posting its highest reading since September 19, 2008. Moreover, the Keefe, Bruyette & Woods U.S. Bank Index (BKX) held support at a key level and then reversed to the upside. Since most analysts believe that a healthy banking system is a must for a legitimate turn-around in both the stock market and in the economy, this aspect of last week’s market data was crucial. Friday’s employment data was no doubt disappointing. So was last week’s S&P/Case/Schiller home price report. Uncertainty over the possible extension of the Bush Tax Cuts, along with mild disappointment over the inability of the Erskine Bowles/Alan Simpson-led debt-management commission to get the 14 votes needed to bring their tough recommendations to a Congressional vote remain important factors to investors. A shift in sentiment regarding each of these concerns, however, was clearly evident last week; and this momentum change by itself appeared to be a breath of much needed fresh air. You are currently browsing the Charted Territories blog archives for December, 2010.